When to cut your cake depends on the type of reception you have and your personal preferences. The most common time to cut the cake is right after dinner, but before dancing. As cutting the cake is often a favorite tradition among guests, scheduling it right after dinner ensures that the highest number of people will be there to enjoy the moment. It also puts everyone in a happy mood before heading to the dance floor. Be sure to coordinate with your photographer so they can document the moment in just the way you want. If you want to go a less traditional route you could cut the cake immediately after your grand entrance and first dance. This option rolls all of the more theatrical moments of the reception into one, allowing the bride and groom to relax and enjoy the rest of the evening after being in the spotlight. 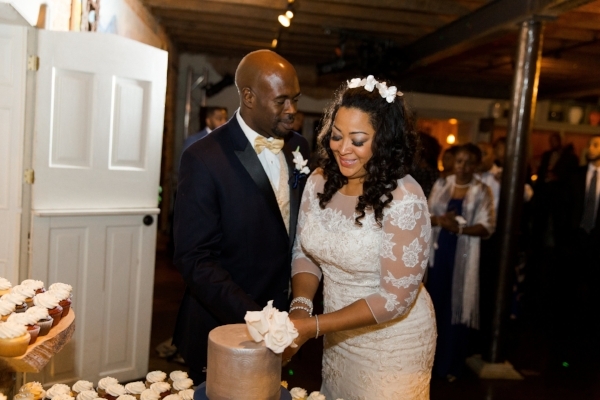 Guests typically view cutting the cake as the first act the newlyweds accomplish together. It also represents the couple’s commitment to provide for one another. These more romantic ideas are often what attract couples to the tradition. However, according to the rules of etiquette, cutting the cake also plays a more practical role: it signifies that the main portion of the reception has ended. Many guests, and especially those of older generations, view the cake cutting as a sign that they are free to leave at their convenience. If you cut the cake earlier in the evening it doesn’t mean the party has to stop, but rather allows those who may need to leave early to do so without feeling they have committed a social faux pas. 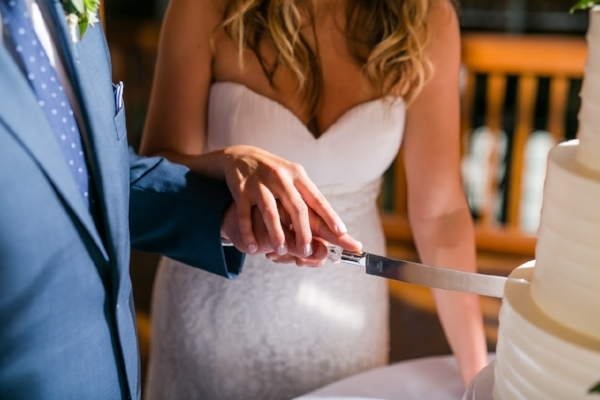 If you choose to have the cake cutting toward the end of your reception keep in mind the signal you are sending your guests and the extra hours you may have to pay your photographer to ensure you capture the moment. Don’t hesitate to forgo smashing the first bite of cake into your loved one’s face. Dessert forks are always an option over fingers. They will also make a nice memento along with your cake knife and server. Be sure to consult with your cake provider about the best part of the cake to cut first (typically the bottom tier). Consider also having a smaller grooms cake to highlight a different flavor profile and showcase the groom’s interests or hobbies. Tradition dictates freezing the top tier to eat on your first anniversary. If year-old frozen cake doesn’t appeal to you, try ordering a smaller cake from the same bakery to celebrate your first year of wedded bliss. Without all the excitement, photographs, and people watching, it might even taste better than it did on your wedding day!